Silhouettes of tall coconut trees arch towards the pristine blue waters, the silence of nature is only broken when birds chirp, and while houseboats cruise through the vermilion towards the setting sun and their oars slap hard against the water. It's indeed a heaven that's cuddled up within God's Own Country. Yes, we're talking about the sleepy little hamlet, Alleppey. If there's one place that seems to be straight out of postcard-perfect visuals, that has to be the land of rustic Kerala backwaters. Hundreds of tourists throng up in Alleppey only to experience luxuriating in a houseboat: it's an escapade that words fail to describe. A day at one of the houseboats includes halting by the banks of Vembanad Lake (Kerala's largest) for some delicious preparations of fish, made from the the day's freshest catch. The town puts on a festive attire during its boat-racing season; schedule your trip accordingly and you'll get to see Alleppey in its most vibrant shades. 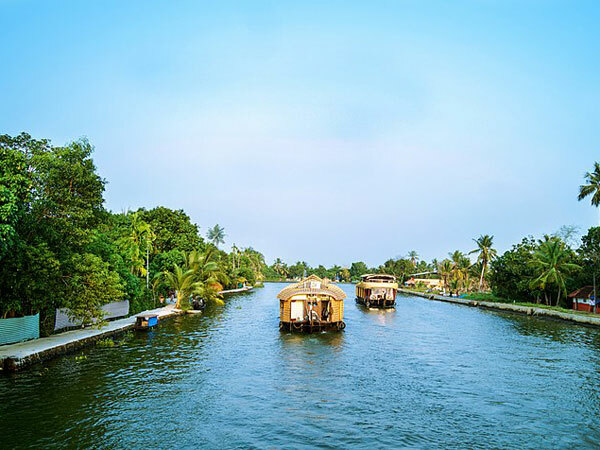 However, if you can get over this Little Venice of East, there are ample other destinations in and around Alleppey that are no less picturesque to tempt the wanderer in you. Here we've listed out 13 such stunning places. Take a look. Spread over an area of 75 km-starting from Kochi to Kollam-the fascinating backwaters of Kuttanad lie sandwiched between the hills and the sea. If you're taking a full-day journey in a rice-barge or houseboat, you get to catch glimpses of the rural and agrarian lifestyles led by the local people. Do not miss an opportunity to savour authentic Keralite food on a beautiful night under the stars, amidst a traditional village setting. Visit Krishnapuram Palace at Kayamkulam to have a glance of the perfect Kerala-style architecture. Although a protected monument by the Archaeology Department, the palace now stands as an archaeological museum. Being at the Alleppey Beach feels like this beautiful place has been set-up for you to unwind yourself. Imagine walking down the 137-year-old ancient pier that stretches out into the beach. Or standing on top of the ancient lighthouse, overlooking the mesmerising beauty of the dense palm groves with the salty wind caressing your hair. Dreamy, isn't it? Located about 5 km east of Alleppey, the village of Karumadikuttan is a renowned Buddhist pilgrim centre that hosts a special Buddha statue from the 11th century. Stories about the healing powers of this statue, which is carved out of solid black granite, attract people from all over the nation. The lesser-known Marari Beach is perfect for anyone who, besides exploring the Kerala backwaters, feels like lazing around at the beach as well. This undeveloped "hammock beach" is the perfect destination to indulge in activities that depict the traditional charm of Kerala; undergoing Ayurvedic treatments and spas is just one of them. Pandavan Para or the Rock of the Pandavas is located near Thenmala in the Kollam district. It is usually an ideal picnic spot where one can feast their eyes on the adjoining hills, forest covers, the Kallada Dam and the lake behind it. Bird lovers out there, the small island of Pathiramanal is famous for its bird-watching opportunities. They say the view from the island is so amazing that you will never want to leave. Vembanad Lake is the largest and longest lake in Kerala. Here you can not only dine on a huge variety of freshly caught fish but you can also indulge in fishing yourself. Mark your calendars, as every Onam this lake witnesses a series of high-spirited boat races. Located on the banks of the Vembanad Lake, Kumarakom Bird Sanctuary introduces you to the variety of migratory birds that flock in from the Himalayas, or even from as far as Siberia. Houseboats and motorboats take you around the lake for bird-watching cruises. This one is a century-old temple situated at the heart of the Alleppey city. Home to Goddess Bhagavathy, the temple premises has a large quadrangle with vast corridors and chambers for different gods and goddesses. It's a must-visit destination for pilgrims, architecture enthusiasts and photographers alike. The Kayamkulam Lake is a brackish water lagoon that connects Kollam to Alleppey. The lake opens into the azure waters of the Arabian Sea and definitely is one of the most scenic backwaters of Kerala. The serene village of Pallippuram is surrounded by water on three sides. One must visit the Pallipuram Church, which was built in the 3rd century. Besides, going on a ferry ride is a good option to explore the area. The Bay Island Driftwood Museum at Kumarakom boasts of its large collection of superior quality driftwood articles prepared through a rare and innovative art form. Here, you would find a vast collection of root sculptures of various shapes, designs and high artistic values. By Air: Alleppey is around 83 km from Cochin International Airport which, by taxi or car, and shouldn't take over 2 hours or so to cover. By Train: Alleppey has its own railway station which is well connected by trains to Cochin and Trivandrum. From the railway station, you can even board a bus or get in an autorickshaw to reach the main city. By Road: Alleppey can be accessed by National Highway 47. It is also well connected, by regular buses, to other cities such as Kochi, Kottayam, Thiruvananthapuram, Kozhikode, Chennai, Bangalore and Coimbatore. So, what are you still thinking about? God's Own Country is waiting, with arms open, to welcome you.